Scientists say nation must choose: Planned fires or more unchecked wildfires? The harder we struggle against wildfires, the deeper we sink, like we’re in quicksand, says Mark Finney, research forester for the U.S Forest Service’s Rocky Mountain Research Station. In a nutshell, Finney and other forest experts say, periodic fires reduce fine fuels such as pine needles. They stop young conifer trees from growing into big conifers. Meadows form and break up continuous stands of mature forest. That’s how fire worked its magic for thousands of years. Then, about 100 years ago, we started putting out every fire, or trying to, and that threw the ecological processes out of whack. In fire’s absence, conifers and dead fuels proliferated. So now when the forest ignites, there’s more fuel to consume and the flames are more difficult to control. And these days, there are 44 million homes next to forests at risk from wildfires. Reducing the risk of wildfires to those homes is counterintuitive. So-called good fire is planned, prescribed burning to reduce the fuels that can contribute to those big destructive fires that are growing more common in the nation’s forests, he says. At the same time, controlled fires help create species and age conditions in forests that are less monolithic and more mosaic. Finney and other fire experts argue that we need to let good fire out of the box and start using it instead of just fighting it. Fire depends on a triangle of factors: fuels, weather and topography. Fuels can be changed through mechanical methods such as logging, thinning and mowing. But the most effective and least expensive way to remove fuels over large areas is by mimicking nature and using “broadcast burning,” or letting fire spread across the ground, Finney says. “The evidence really shows us the wildfire behavior under extreme conditions can be modified very effectively if we employ those kind of techniques,” he said. Fire consumes litter and duff, and burns up trees too small to sell. And the heat kills lower limbs, foliage and rotten wood so there’s less available for future wildfires. Finney estimates that fuels in 30 percent to 40 percent of the nation’s forests need to be modified or managed to minimize the risk of large wildfires. Finney compares the needed fuel treatment work to preventative health care, which is more effective than waiting for an emergency. If people are comfortable with the current condition of the forests, where extreme and uncontrollable wildfires are inevitable, “then we’re doing fine,” he says, noting it’s up to society, and not him, to make those decisions. Jim Menakis is a champion of prescribed fire and says we need more of it. Menakis is a national fire ecologist for the U.S. Forest Service. More than 70,000 communities and 44 million homes are at risk from wildfire in the wildland-urban interface, where forest and civilization meet, according to the Forest Service. Over the last 10 years, more than 35,000 structures were destroyed by wildfires – an average of 3,500 a year. And wildfires are burning holes in the Forest Service’s budget, too. 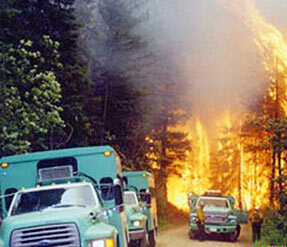 In 1995, fire suppression costs took 16 percent of the Forest Service’s budget. By 2015, that figure hit 52 percent. Projected costs for 2025 assume wildfires will consume 67 percent of the agency’s budget. In 2006, the Forest Service began a program to evaluate the effectiveness of prescribed fire and mechanical treatments designed to reduce the risk of wildfire. The goal was to evaluate the effectiveness of a fuel treatment each time it interacts with a wildfire. For example, if the treatment prescription was meant to stop a crown fire, making it a more manageable surface fire, was the goal reached? Over the past 10 years, more than 3,000 fuel treatments have occurred on Forest Service lands. The best fuel treatments are usually a combination of mechanical work to change the forest structure followed by prescribed fires to address surface fuels, in Menakis’ telling. “When we don’t have surface fuels treated, we’re seeing mixed effects on units,” he says. Some question whether thinning a forest with fire or equipment increases the wind speed, pushing wildfires even faster, and it’s a fair question, Menakis says. One study showed that the rate of fire spread through surface fuels is a little greater in thinned areas. But the reason for thinning is to prevent crown fires that shoot embers a half-mile in front of the fire, Menakis says. Prescribed fires help change the vegetation and ladder fuels to create an environment where a more manageable surface fire is likely, he believes. Setting fire to control fire is better accepted in some places than others. Each year, 800,000 to 1 million acres are treated by fire in the Forest Service’s Southern Region, which covers 13 southeastern states and Puerto Rico. That’s the most in the nation, says Dave Martin, the region’s deputy operations director. Martin credits a combination of factors for why the South seems more accepting of prescribed fires than other areas of the country. One is that the fuel types in the region are fire adapted, but it’s more than that. Cool and damp evenings reduce the chances of fires escaping containment, and there’s less smoke in those conditions. “We don’t end up having to do a lot of mop-up,” Martin says. Many areas where treatments are planned are based in agriculture. “It’s historically been a tool in the Southeast for timber management and land management, so I think we have a lot of that going for us in the acceptance of it both by the public and communities,” Martin says. Still, acceptance doesn’t come easy. That’s been especially true as prescribed fires have increased in the drier deciduous forests in the Appalachian Mountains, where fuels have been building up over the past 20 years, Martin says. Education has been critical to maintaining public support for the prescribed fire efforts. “That definitely helps getting the public acceptance, or at least understanding of what we’re doing, particularly when it comes to the impact on the public – smoke impact and things like that,” Martin says. Very detailed prescription plans are written before treatments occur, he says, and the work always must be balanced with the impact on the public. RELATED New Jersey forests and fire? Really?! Sometimes, just meeting those specific parameters is a barrier to success. There may be areas where the goal is to burn 10,000 acres, but only four or five days have the right weather conditions for burning. Another critical component in the plans is managing the smoke impacts. Atmospheric conditions such as lift, dispersion and wind direction must be carefully considered so smoke doesn’t waft over sensitive populations. Residents in the Southeast have more experience in dealing with prescribed fire, which explains a different mindset about living with and using it, says Menakis, the Forest Service ecologist. It’s not uncommon for several landowners to work together on a fire treatment to reduce fuels, he says. Smoke is a concern, but it is more accepted. “I think it’s just cultural,” Menakis says. For landscapes in the West, fire frequency is less, maybe once every 30 years in some locations, which could be a once-in-a-lifetime event for some. “We don’t look at these systems as a functional ecological system that changes over time,” Menakis says. Menakis also saw more acceptance of fire when he traveled to the grassland savannas of the Republic of Congo decades ago. U.S. forest experts had been invited to the country to provide expertise on wildfires. Fire was a part of the lifestyle there and was used as a tool, he says. He recalls seeing a woman hanging laundry, unconcerned as fire burned 100 feet away. Native Americans used fire as an active tool as well. Menakis doesn’t think records show how much fire was on the landscape historically. That said, it’s not practical today to go back to the fire ecosystems that were in place when Native Americans were setting fires hundreds of years ago, or later when Europeans arrived and started putting them out, he says. Forests that were encountered by European settlers in the early 20th century had been created by thousands of years of fire processes, Finney says. Before their arrival, forests in the West, especially at low- to mid-elevations, were characterized by large trees with open areas, Finney says. That resulted from frequent fires. In some locations, such as California, fires occurred every year or two. In other locations, they were less frequent, maybe every 50 years. To white settlers, using fire to benefit the landscape was a foreign concept, at odds with principles developed in German forestry, Finney says. So they put all their efforts into fire suppression. “The fire has got to be a big part of our world going forward,” Menakis says. But people will need to be willing to put up with smoke, which Menakis notes is also part of the forest ecosystem. Temporary minor smoke impacts from prescribed fires are the price to pay to address a longer-term problem, Menakis says. The concept of using fire for its benefits isn’t new, and progress is being made, but a new policy is connecting dots in the effort, Menakis says. The goal of the National Cohesive Wildland Fire Management Strategy is strengthening collaboration among stakeholders across all landscapes, using best science, to create resilient landscapes, fire-adapted communities, and a safe and effective wildfire response. “I think our management needs to move us in that direction,” Menakis says. When extreme wildfires are putting up smoke and threatening watersheds and communities, people welcome actions to stop fire, Finney says. Funding also is available then. Treatment projects that differ from historical uses of the land, on the other hand, can be met with skepticism. The pace of work is slow, and the money is short. But catching up on the backlog of untreated landscapes is achievable, Finney adds. It would take ramping up treatment four to five times what’s being achieved today. To chip away at untreated fuels will take a coordinated, strategic planning effort among private and public landowners that considers landscapes, not just local areas, because fires can quickly move vast distances. People may think fire is somebody else’s problem, but a big blaze can run 10 miles in a day, Finney notes. That’s not always apparent to homeowners, even if it is known by professionals. “It’s kind of an eye-opening reality for a lot of folks because they are not used to thinking about how far fires can move,” he said. Karl Puckett is a Montana-based natural resources reporter. You can burn it now-low and slow-or you can burn it later, hot & fast, either way- it’s to going to burn! The old adage: pay me now or pay me later at work. The difference is a positive outcome vs a negative one. Karl Puckett has nailed the fire story so many journalists, politicians and the public miss. One hundred and seven years into America’s war on wildfire, and we still aren’t doing .it right. Resource pros know what to do. What we’re doing isn’t working. About time we let the professionals do their best. True for one type of fire regime; not true for anthropogenically driven crown fire ecosystems with long fire return intervals – these require ignition prevention and rapid, effective fire suppression to reduce fire frequency and area burned e.g. Southern California chapparal and Great Basin sagebrush. Agreed. I get tired of these articles using only one type of fire regime to explain solutions to increasing wildfire size. Is there an update or most current version of the 2010 US MAP. Learned a lot after reading. Tough decision on what to do but I agree we have to let the individuals / groups with the knowledge and experience way in on this and make the right decision. California, Wildfires tell it all! Has Planned Burning worked for them? No! Fires still destroy more and more every year! All planned fires do is kill people due to lung complications and other diseases! Every time they set a fire people visit the ER! Nature has it’s own way of dealing with our forests, and I don’t know how it survived all these years without the help of man? Funny thing, our air was a lot cleaner back then as well! Every time a fire is started, it cooks what ever was put on that ground, so if they burn a site where they did nucular testing all the poison in that testing site ground is going to be released back into the air. The same with whatever other man made toxicants is in the ground, because it doesn’t just go away! Every time our forestry service lights a match, they are poisoning our air, and the people in it! So they are doing more harm, then good, and as always, “We The People” pay for our Governments stupidity!